For predictive maintenance, the electrical equipment in automated production is being increasingly closely monitored. Control systems require, inter alia, Information about the power flow. HARTING has developed sensors that precisely represent the current consumption of actuators. Comparing the results with other process data, the controller can derive information about possible malfunctions. The control system intervenes before an error occurs. Performance and miniaturisation have made tremendous progress even with the simpler types of current sensors. The effort it takes to increase the sensor density in automation has decreased significantly. The HCME series works according to the principle of direct mapping – open loop – and uses rectangular cores. The devices achieve a precision, which in many installation situations can compete with the accuracy of the considerably more expensive compensating current transformers (+/- 0.5%). Due to the rectangular shape, the new sensors save space and can be easily installed on a power rail. Current sensors offer a simple and compact solution for monitoring frequency converters. On top of that, mechanical engineering is increasingly using aluminium conductor rails for power supply, which can be monitored with the help of sensors. With the HCME series, HARTING has optimized the open-loop sensor for the assembly situation on busbars. Result are devices with the compact dimensions of 6 cm height and 14.5 cm width. The feedthroughs for the rails are up to 64 mm wide and 21 mm high (special formats possible). In addition, mounting holes are set up on the housing, through which the sensors can be applied directly to the current rail, using two screws. Due to their rectangular shape, the HCME current sensors can be easily mounted directly on the current rail. Current sensors offer a simple and compact solution for monitoring frequency converters. On top of that, mechanical engineering is increasingly using aluminium conductor rails for power supply, which can be monitored with the help of sensors. With the HCME series, HARTING has optimized the open-loop sensor for the assembly situation on busbars. Result are devices with the compact dimensions of 6 cm height and 14.5 cm width. 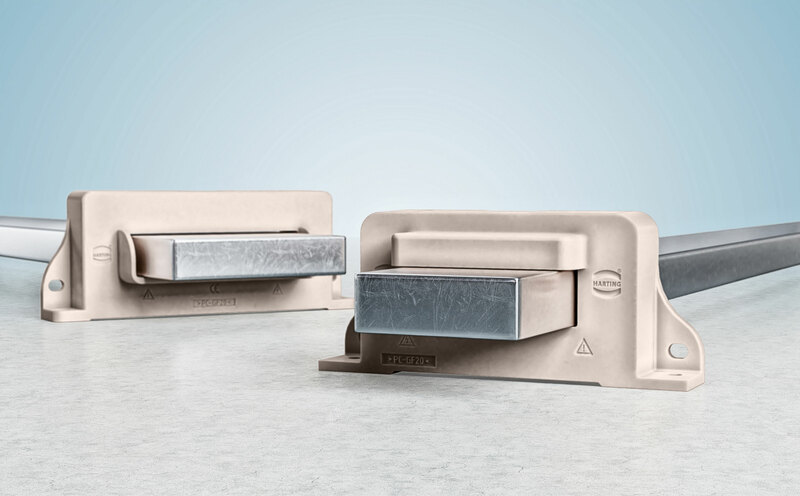 The feed-throughs for the rails are up to 64 mm wide and 21 mm high (special formats possible). In addition, mounting holes are set up on the housing, through which the sensors can be applied directly to the current rail, using only two screws. The wide temperature range from -40° C to + 85° C permits use even under extreme environmental conditions. Due to their high reliability, the sensors are ideally suited for use in frequency inverters and in the supply of power to high-performance loads. In addition, the HCME current transformers are reliably protected against interference, e.g. such as that caused by the magnetic fields of external current carrying lines. 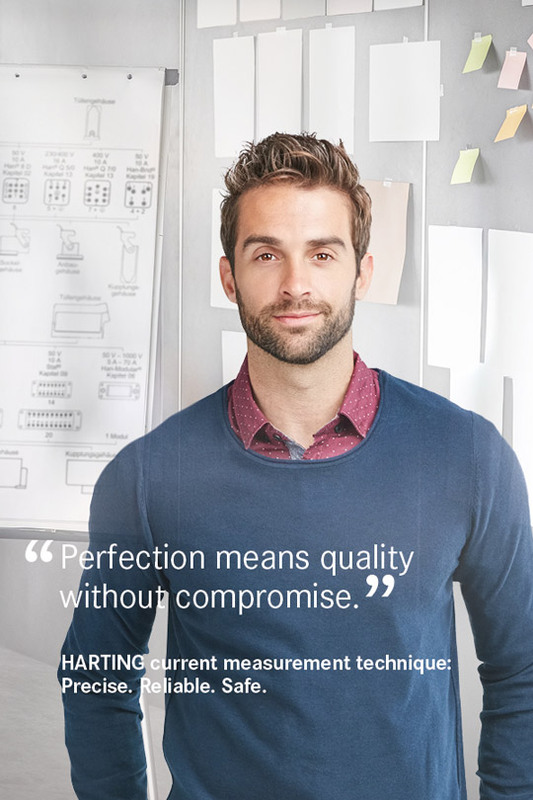 HCME stands for HARTING Current Measurement Eco. The series includes 7 current transformers for currents between 0 and 5,500 amperes. The HCME sensors have gained considerable ground compared to the closed-loop sensors. They can measure direct as well as alternating currents between 0 and 50 kHz, with the range coming in at 0 to 100 kHz for the compensation current sensors.